In a paper published today, August 29, in the journal Nature, the AWAKE collaboration at CERN, which includes Luis OS, Jorge V, Nelson L, Ricardo F, Mariana M, and Anton H, from GoLP/IST, reports the first ever successful acceleration of electrons using a wave generated by protons zipping through a plasma. The acceleration obtained over a given distance is already several times higher than that of conventional technologies currently available for particle accelerators. First proposed in the 1970s, the use of plasma waves (or so called wakefields) has the potential to drastically reduce the size of accelerators in the next several decades. 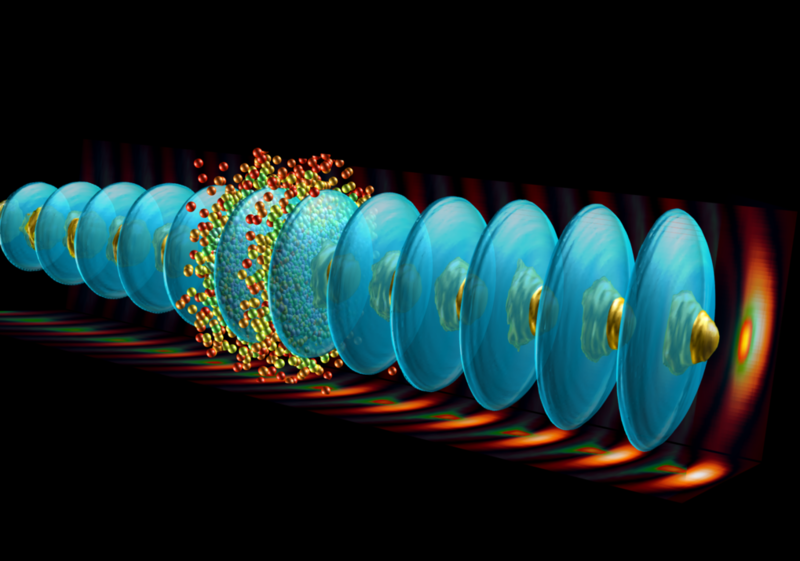 The image, by Jorge V, illustrates the concept: the proton beam breaks up in small beamlets (yellow), that drive a plasma wave and the corresponding electric field (blue isosurfaces), that accelerate the co-propagating electrons (small spheres, where color is proportional to the energy of the electrons). AWAKE, which stands for “Advanced WAKEfield Experiment”, is a proof-of-principle compact accelerator project for accelerating electrons to very high energies over short distances. Accelerating particles to greater energies over shorter distances is crucial to achieving high-energy collisions that physicists use to probe the fundamental laws of nature, and may also prove to be important in a wide range of industrial and medical applications.